Contrary to popular belief, Halloween is not a modern American invention. The Christian Halloween or All Hallows' Eve dates back to the 1700s but it is based on the much older Gaelic pagan festival of Samhain. 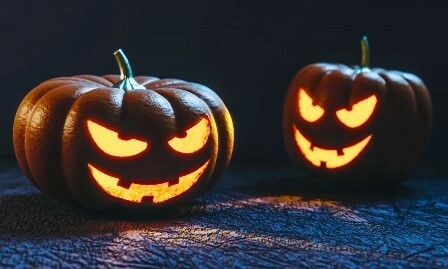 The Celtic tradition of carving a turnip, or Jack-o'-lantern, was based on the strange lights that flickered over peat bogs, called "will-o'-the-wisps". Scots and Irish kids still carve turnips but we have substituted pumpkins which are larger and softer and so are easier to carve scary faces into. Trick or Treat comes from the tradition of wearing costumes or going in disguise so that evil spirits won't recognise you. Scottish wee munchkins dress up and go "guising". Indooroopilly Shopping Centre has got a free Halloween extravaganza for the whole family to enjoy. From Thursday 26 to Sunday 29 October, you can enjoy free Halloween pumpkin head putt-putt course and centre wide trick or treat course - the biggest in Brisbane. You will need to book for trick or treat. Head over to Concierge (on level 2) to collect your trick or treat passport when you arrive. 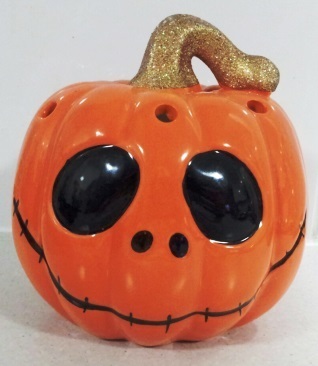 The trick or treat course will finish outside Kmart on level 1, where you can enjoy pumpkin head putt-putt with the whole family. Bookings required for putt, so get your outfits ready and come in disguise for an unmissable Halloween with lots of treats. For further information and to book trick or treat click here. Take part in a special storytime for Halloween. 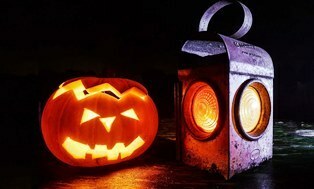 Dress up in your scariest costume to enjoy Halloween inspired spooky tales and ghoulish games. No tricks, just a whole lot of safe fun. For further details and to make bookings click here or phone 07 3403 8888. If you are looking for a scary Halloween story, I can recommend the Smurf comic book Halloween. 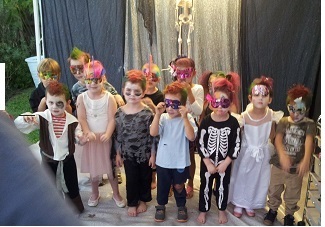 Ideal or boys and ghouls aged 3 to 12 years old and their carers. Ideal or boys and ghouls aged 5 years and older. Ideal or boys and ghouls aged 5 to 12 years old. Calling all little monsters! Join in for a truly monstrous craft activity. Freaky Fun. Ideal or boys and ghouls aged 5 to 12 years old and their carers. 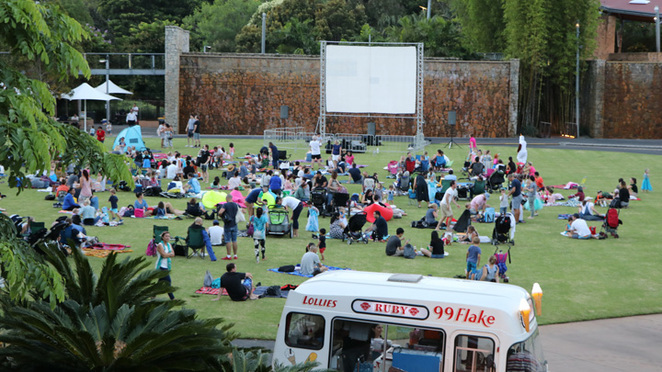 Movies in the Park returns with a fun, free, special Halloween screening of two great movies and a great line up of fantastic food trucks. The Disney/Pixar classic Monsters University, with Sully and Mike, will be screening at 6:15pm to 8:00pm. It will be followed by Edward Scissorhands starring an almost unrecognisable Johnny Depp (but still gorgeous) at 8:15pm to 10:00pm. The screen is located in the Celebration Precinct. Please bring along your picnic blanket, pillows or chairs. Please be mindful of those behind you on the lawn if you are using a chair. Roma Street Parkland can be accessed from Roma Street train and bus station. There is limited parking on Parkland Boulevard or College Close Car Park. Dead Legends in the Bistro, at the Bonnyview Hotel. Jeffrey Hancox will be performing as Elvis/Roy Orbison/Johnny Cash. Come dressed as your favourite dead legend. There will be a prize for the best dressed. 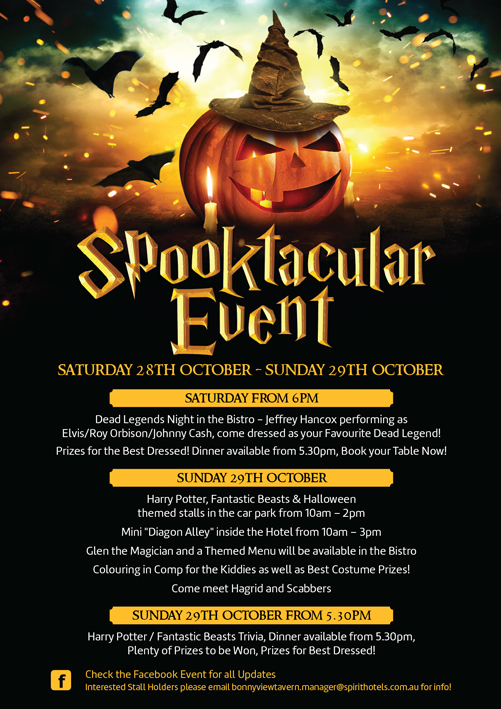 Harry Potter - Fantastic Beasts and Halloween themed stalls in the car park from 10am to 2pm; and in the mini "Diagon Alley" inside the hotel from 10am – 3pm. Colouring in competition for the kids as well as best costume prizes. Meet Hagrid and Scabbers. Come along for a great "spooktacular" day out. free sausage sizzle and cold drink. For further information and to book in click here. Why? Some of the best things in life are free.